Customize silicone bracelets to raise awareness on Melanoma. Melanoma is the deadliest skin cancer. Rates of its diagnosis are on the rise, even though some other cancer diagnosis rates have fallen. To raise awareness of how easy it is to detect and cure melanoma - and how easy it is to prevent it - the American Academy of Dermatology has designated May as Melanoma Awareness Month. You can help support the cause by designing Melanoma awareness wristbands. Because the aim of the month is to educate as many people as possible, hospitals and other medical centers will be hosting skin cancer screenings. These events are a great chance to give people reminders in the form of wristbands. The bands can be custom-made specifically for Melanoma Awareness Month - they can be black, the color associated with the cause, and they can have sayings or phrases imprinted on them. For example, they can say “Don’t forget sunscreen!” or “Set a date for a monthly skin check.” To stand out, the bands can also have glitter or can be made in thicker widths for a more unique look. Melanoma is the most serious form of skin cancer. Here are some important statistics about melanoma awareness from The American Melanoma Foundation. Most melanomas (70%+) begin in or near an existing mole or dark spot on the skin. Melanomas have an irregular appearance and are usually larger than an ordinary mole. Melanoma in individuals 10-39 years old is highly curable, with 5-year survival rates exceeding 90%. 1 in 58 men and women will be diagnosed with melanoma during their lifetime. Caucasians and men older than 50 years of age are at a higher risk of developing melanoma than the general population. One American dies of melanoma almost every hour (every 61 minutes). Melanoma is the most common form of cancer for young adults 25-29 years old and the second most common form of cancer for adolescents and young adults 15-29 years old. Melanoma is increasing faster in females 15-29 years old than males in the same age group. In females 15-29 years old, the torso is the most common location for developing melanoma, which might be due to high-risk tanning behaviors. The World Health Organization estimates that as many as 65,161 people a year worldwide die from too much sun, mostly from malignant skin cancer. People with more than 50 moles, atypical moles, or a family history of melanoma are at an increased risk of developing melanoma. The Melanoma Research Alliance points out that warning signs of melanoma can be noted on moles. Asymmetry, uneven borders, a variety of colors, a large diameter, and evolution of a mole can all indicate malignancy and should be checked by a doctor. Why Buy Melanoma Awareness Wristbands from Amazing Wristbands? All products from AmazingWristbands.com are made of 100% silicone, making them safe, durable, and non-allergenic. We never supplement any of our silicone products with latex like some of our competitors. 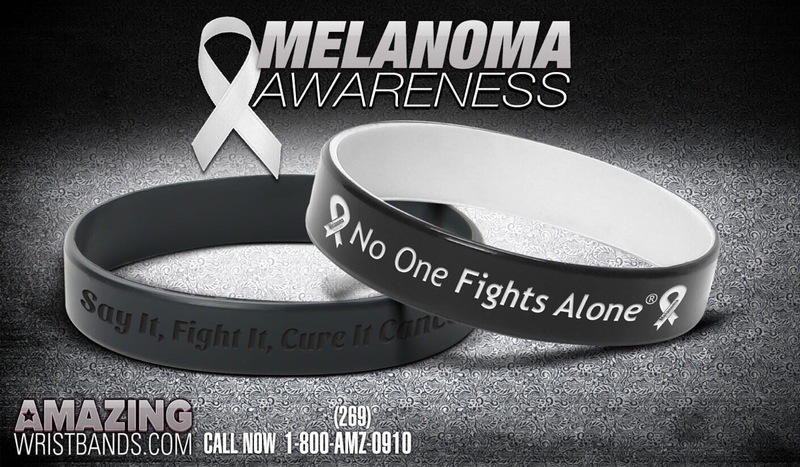 Amazing Wristbands is a leading provider of personalized silicone bracelets available online, including melanoma awareness bands. Our professional and friendly staff will help you design your melanoma awareness bracelets to increase awareness or raise money for melanoma causes. We offer a wide variety of wristband types and colors to help your bands stand out and make a difference. In addition to standard wristbands, we also offers super popular slap bands that "snap" to a person's wrist, as well as one-inch bands, narrow bands, silicone rings and silicone key chains. Wear them, share them, or sell them, and see how popular your Melanoma Awareness Month wristbands become! At AmazingWristbands.com, we use 100% silicone for your Melanoma Awareness wristbands. We offer speedy price quotes, great customer service, free shipping, free artwork, free design, and no mold fee. 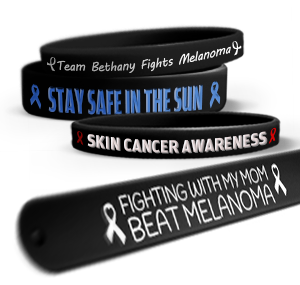 Create your Melanoma Awareness Month wristbands online today! We have a few different product types to offer and I will explain them and let you make your decision. Dual Layer: 5-7 business day turn around A dual layer wristband is a standard wristband that has a layer of screen print painted on the outside surface. When your message is engraved into the wristband the screen printed layer is burned away exposing the color of the standard wristband. This gives the dual layer wristband the effect of having a different color message from the outside color. The one thing to know about this message style is that the outside screen printed layer can wear off over time. 150 - 1/2" Standard Wristband with your design for $126.00 200- 1/2" Standard Wristband with your design for $152.00 Screen printed bands: 10-12 business day turn around A screen printed wristband is a wristband with no engrave message, but with the message just printed on. Due to the fact that it is a screen print the message will eventually fade over time with ware and tear. 150 - 1/2" Standard Wristband with your design for $99.68 200- 1/2" Standard Wristband with your design for $105.58 Custom Screen Printed Wristbands Ink Filled Debossed: Turn around time 10-12 business days Ink filled debossed is the most durable product we have to offer. It is a band with a engraved message with a ink fill color of your choice. This bands will never fade over time. 150 - 1/2" Standard Wristband with your design for $113.97 200- 1/2" Standard Wristband with your design for $121.62 If you have any questions, or would like to place an order please feel free to contact us by email at customercare@amazingwristbands.com or phone at 800-269-0910. Can you give me price quotes on melanoma bracelets? I don't have any idea what the options are. We would probably want to order 150-200.